We also got to see the personalities behind the pink cars, with F1.com's Grill the Grid featuring both Force India drivers, and it was quite an entertaining quiz. Lots of points up for grabs this weekend as the European leg gets underway, do keep your eyes peeled for anything I need to know about! +2 Daniil Kvyat: Getting all musical and sharing a playlist on his Soundcloud page. +1 Daniel Ricciardo: Good insight in Daniel's driver diary after the first four races. +3 Sergio Pérez: Really like this Grill the grid video with the Force India boys - they make good and smiley teammates! +3 Esteban Ocon: Really like this Grill the grid video with the Force India boys - they make good and smiley teammates! +4 Daniel Ricciardo: At first glance you think 'not another workout video' but then, this is Ricciardo we're talking about. +4 Daniil Kvyat: Really enjoyed this kitchen adventure with teammate Sainz, very revealing! 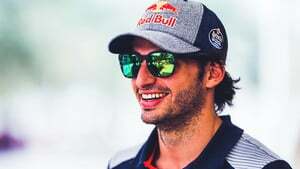 +4 Carlos Sainz Jr: Really enjoyed this kitchen adventure with teammate Sainz, very revealing! +2 Daniel Ricciardo: Rocking out at the top of a tricky mountain climb - do wonder what that guy is doing there though? +1 Stoffel Vandoorne: I'm gonna call it and say he's auditioning for a Baywatch sequel.